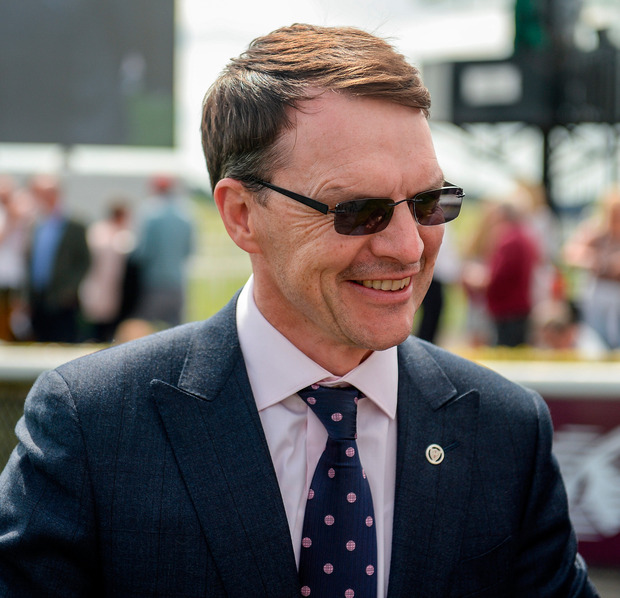 Saxon Warrior will spearhead Aidan O'Brien's charge in next month's Investec Epsom Derby with the Ballydoyle maestro warning that there "should be a lot of improvement to come" as he bids to complete the second leg of a possible Triple Crown. A brilliant winner of the 2,000 Guineas on his seasonal bow at Newmarket earlier this month, Saxon Warrior has always been thought of as a Derby candidate and his record-breaking trainer expects further progress stepping up in trip to 12 furlongs. Already as short as 8/11 favourite for the 239th renewal of the Epsom Classic, the son of Deep Impact leads a likely six-pronged attack from O'Brien as he bids for a seventh success in one of Flat racing's most prestigious races. "We've always viewed Saxon Warrior as a Camelot or Australia type of horse, he's in the same box as those two used to be in. Looking at him, there should be a lot of improvement to come. It'll be exciting to see," O'Brien said. "He was always going to be a middle-distance horse rather than a Guineas horse. We were always looking forward to stepping up in distance but obviously when he did that you wonder, 'Is this fella a miler?' He travelled like a miler and quickened like a miler." No horse since Vincent O'Brien's Nijinsky in 1970 has won the Triple Crown (2,000 Guineas, Derby and St Leger) and while Camelot was controversially denied by Godolphin's Encke in 2012, O'Brien has his eyes fixed on another slice of history this year. "It would be unbelievable if we ever had a horse that ever did it. If there's a chance we had a Triple Crown horse, this was always going to be the horse. And that's why we started him off in the Guineas. We are still alive and kicking after the first round," the 48-year-old said. Other Derby candidates include Derrinstown Stud Derby Trial second and third Delano Roosevelt and The Pentagon, Lingfield Derby Trial runner-up Kew Gardens while James Cook and Zabriskie, engaged in Thursday's Dante Stakes at York, are other possible contenders among his star-studded 190-strong stable. O'Brien is quoted as short as 1/5 to take a record-equalling seventh Derby on June 2 but recent Dee Stakes winner Rostroprovich is unlikely to take his chance with a French Derby bid his preferred target, while leading Oaks fancy September is another which won't make her way to Epsom as she recovers from a setback. Chester Oaks scorer Magic Wand and runner-up Forever Together will lead his charge for a seventh Oaks triumph along with last year's Debutante Stakes winner Magical, while English 1,000 Guineas third Happily is set for a crack at the Irish equivalent en route to the French Oaks. Cheveley Park victor Clemmie will also commence her season in the Irish 1,000 Guineas but "an awful lot of improvement" is expected from that run with Royal Ascot her primary target. Dual Classic winner Capri must wait for an autumn campaign after suffering a shoulder injury following his successful reappearance at Naas last month, while last year's Prix de l'Opera winner Rhododendron and Lancaster Bomber are both intended runners in Saturday's Lockinge Stakes at Newbury provided the ground comes up good.